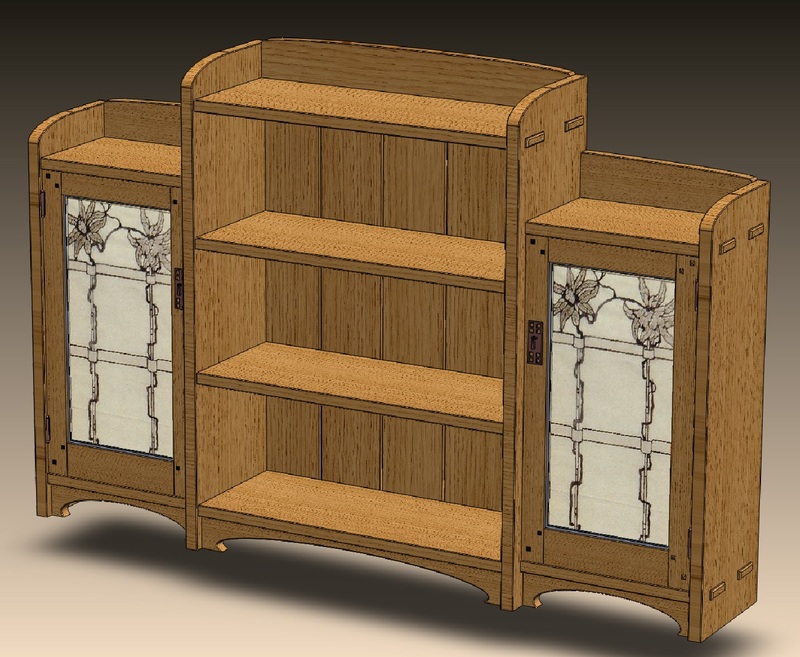 I spent several hours over the past couple of days trolling through the Greene & Greene Virtual Archives, mostly exploring but also looking for inspiration for the stained glass and inlay for this “Mission-ish” bookcase I’m designing. I found some interesting bits in the files for the Earl C. Anthony house, including some drawings for various stained glass panels. I’ve adapted one to work in the doors on the cabinet. 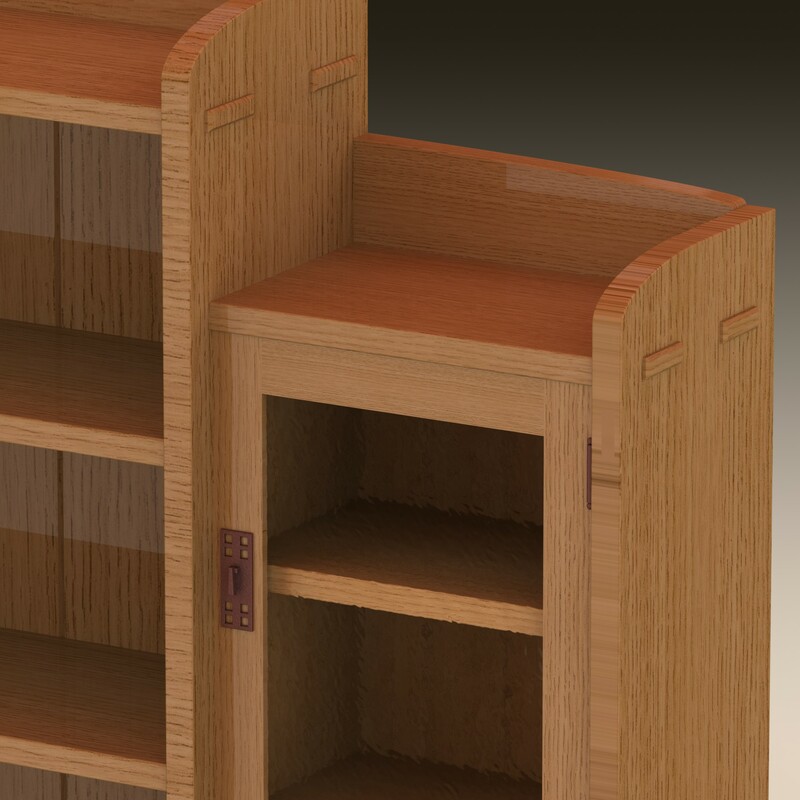 This is just a crop-and-paste of the original image, the horizontal ribbons need to be places at the location where the shelves are, and I have to do all of the fussy detail layout for the glass cuts. 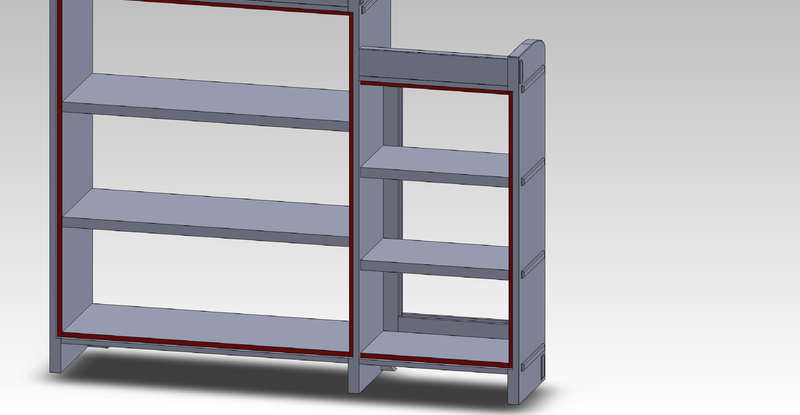 At least if I want to do full scale patterns in SolidWorks. I think this has possibilities. 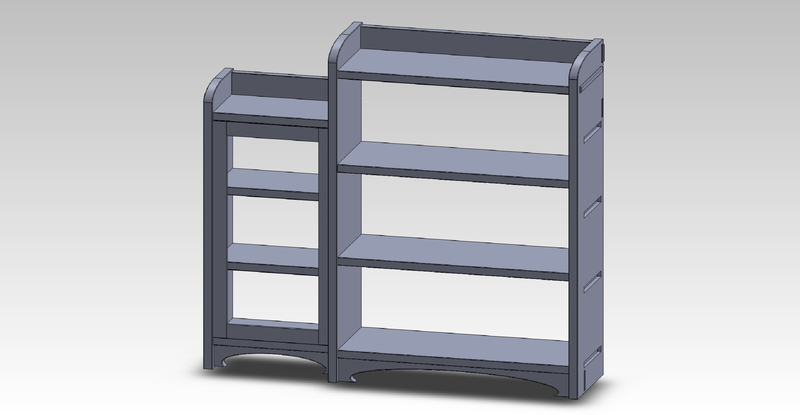 I’ll probably do a simple mockup of one or two other ideas I have before investing a lot of time in the CAD layout. 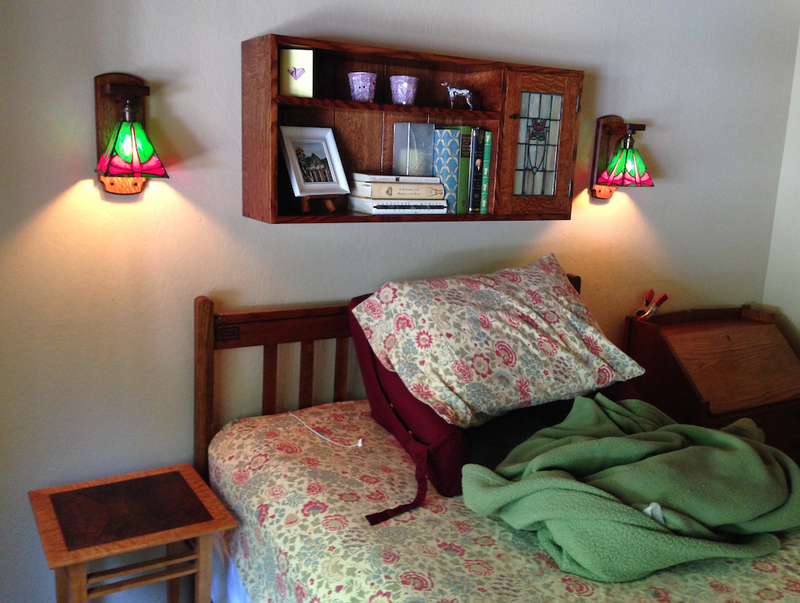 Bookcase with one Greene & Greene-designed stained glass. 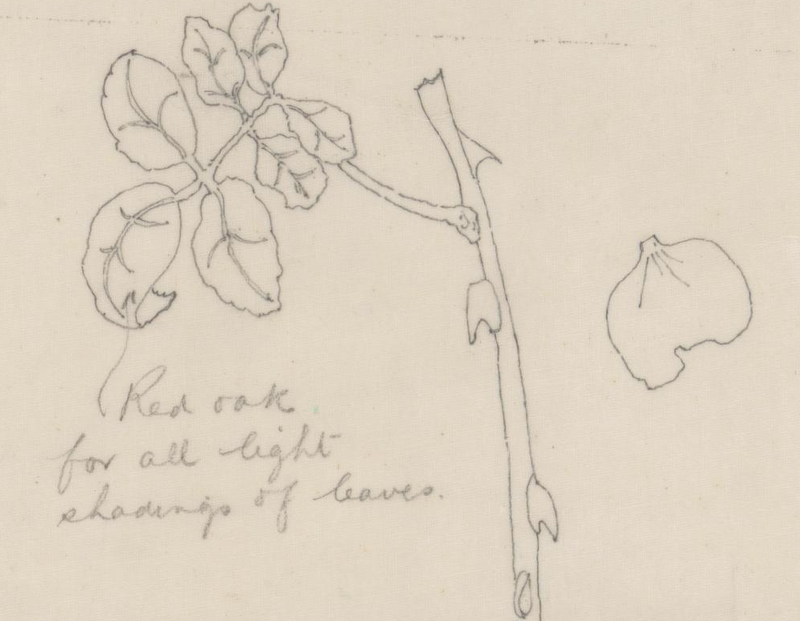 Charles Greene’s design for the fabric for the curtains for the Anthony house, maybe this could be done as an inlay in the backsplash? 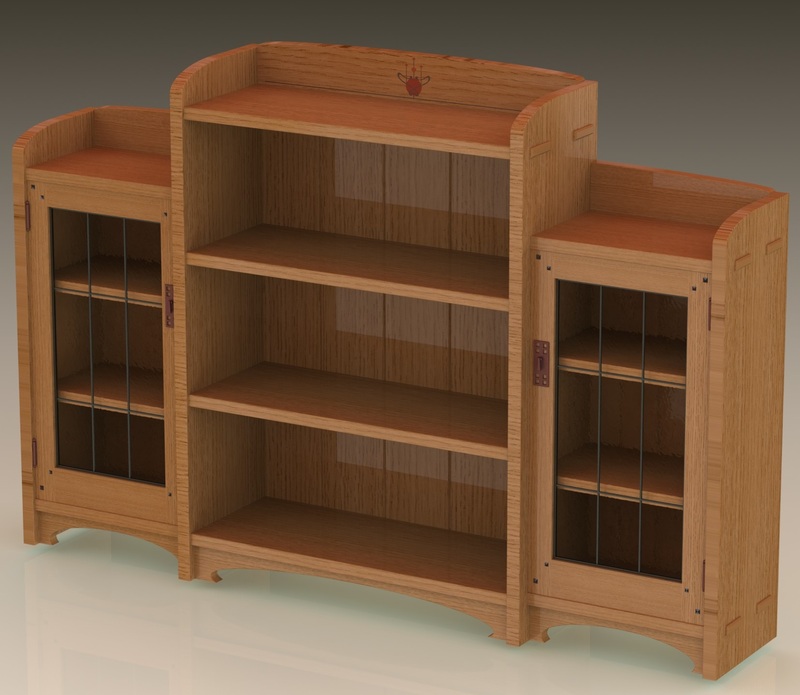 Last weekend I worked through most of the design for an Arts & Crafts bookcase, to the point where I’m pretty comfortable with the scale, style and proportions. I think the joinery is going to be rock solid. I have some concerns about getting the sliding dovetail to work properly, and about getting clean through mortises, but otherwise the construction is relatively straightforward. What’s missing? Aside from some spectacular and unusually wide Quartersawn White Oak planks, I need to sort out the accents that will make this piece “pop”. 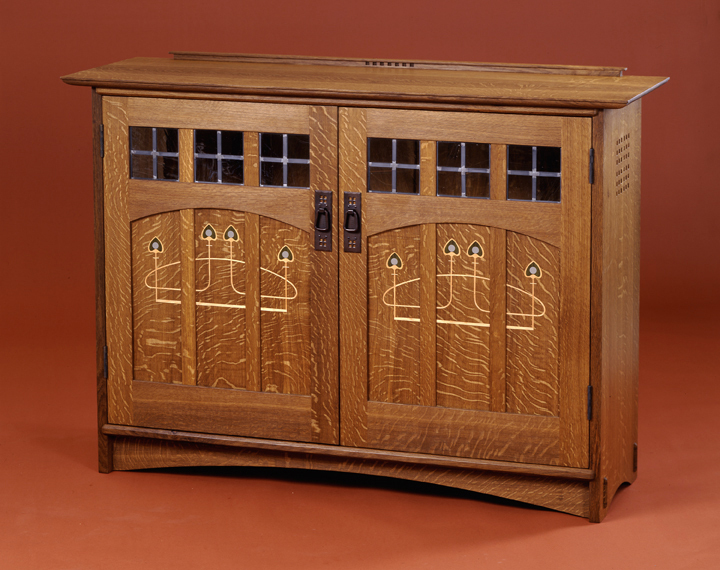 I want to have inlay on the back splashes (at least) and a subtle but coordinated stained glass design for the doors. 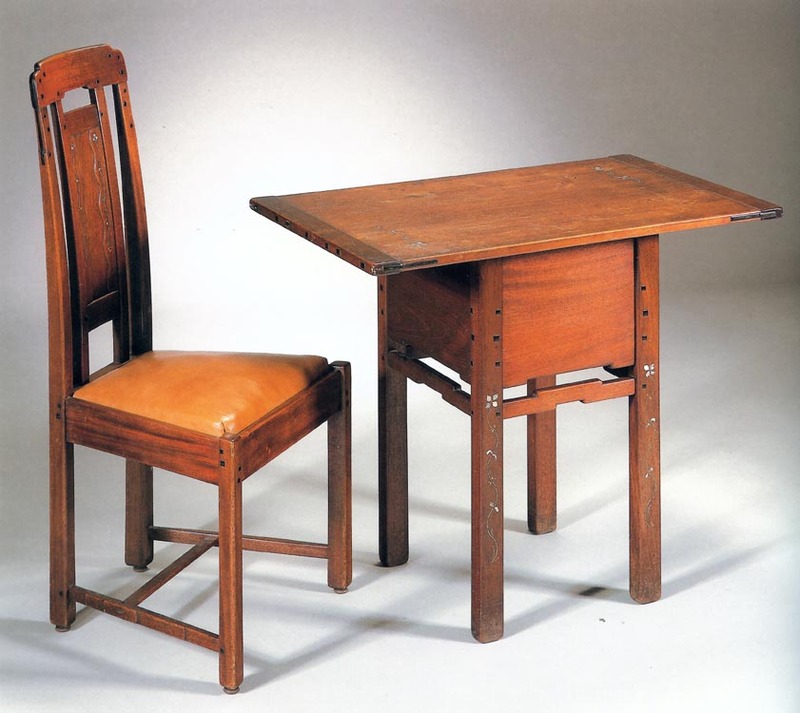 Most craftsman furniture had relatively simple, abstract geometric inlay designs. My understanding is that these are generally attributed to Harvey Ellis. There is even a place (Mission Furnishings) that reproduces these designs in veneer sheets to glue down to a substrate. And others that could certainly be adapted. The veneered panel seems like a simple approach, especially if I could click on a web page and have a canned design delivered that I just need to glue down — but it’s not as satisfying. I also want a design that will coordinate with whatever I do in the stained glass for the doors. I also know that I’ll be dying this piece, and the idea of masking the inlay to keep it from getting colored isn’t a satisfying feeling. I can just see the dye leaching under the masking stencil and ruining the inlay. Ick. There is another factor, which is that a lot of Greene & Greene furniture had delicate inlay designs using wood, shell and metal, and I want to learn how to do that myself. I’ve been greedily gathering videos, images and articles for a while, and I’m eager to try this out. William Ng has taught a class on G&G Inlay in the past, but I don’t see it on his 2015 schedule (rats!). 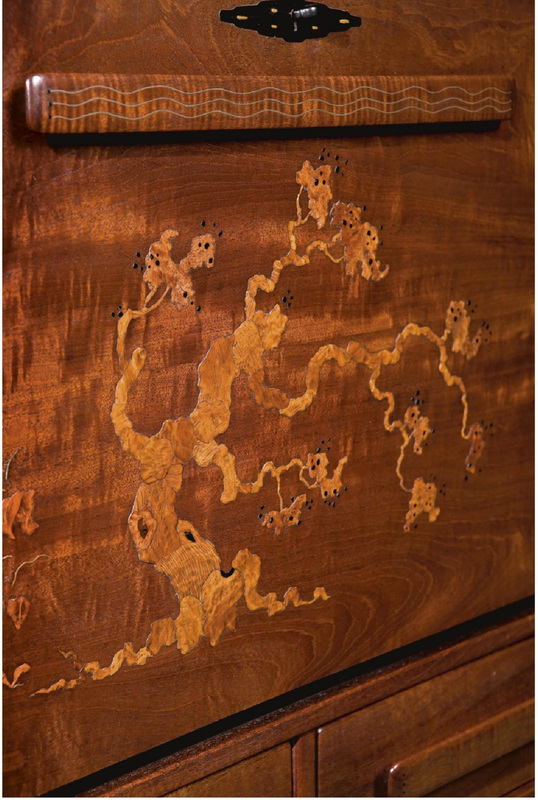 Other Greene & Greene inlay was significantly more complex, like this example from a desk done for the Pratt house in Ojai, Ca. The tree was inlaid in different species of wood, left proud of the surface and carved. I love the organic feel and the Japanese influence of the design. My understanding of the process is the the individual pieces are cut out and then either singly or as a unit scribed onto the surface which is then excavated with a tiny router bit and chisels. 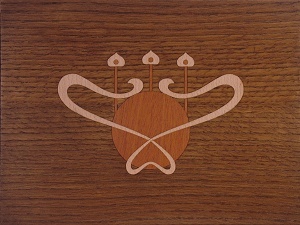 The inlay is then glue into place, and either sanded flush or textured. 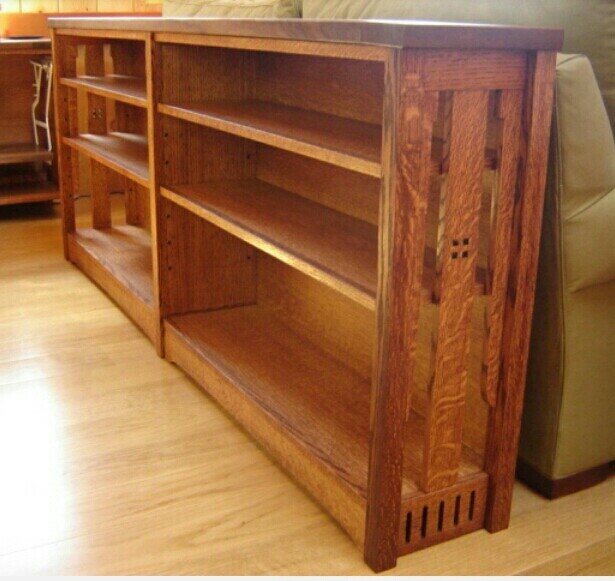 Obviously any dying would have to be done before wood was inlaid, although metal and shell could be done before dying. I found a video that demonstrated the process of doing a flush inlay nicely. I’m definitely going to buy a tiny router base for my Foredom tool and give this a try soon. So, where was I? 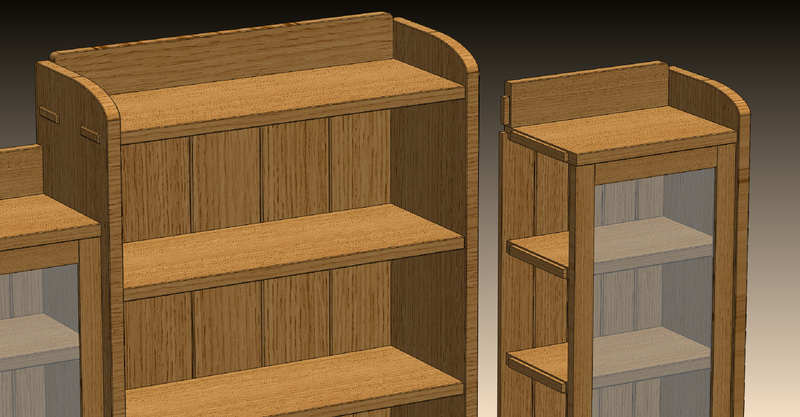 That’s right, trying to sort out the details on the joinery on the Craftsman-styled bookcase I’m designing. 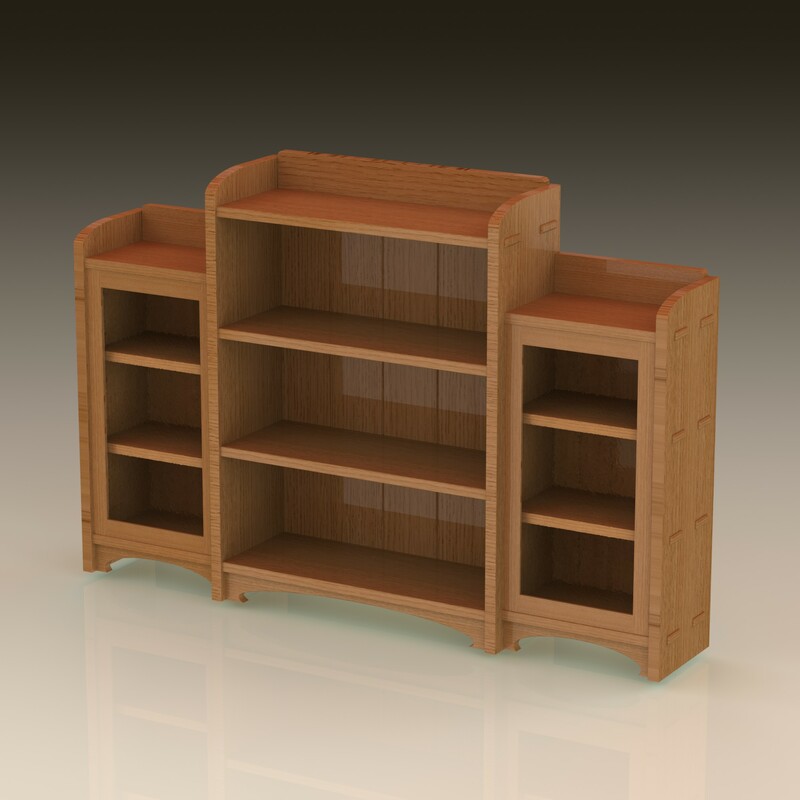 I had the overall structure together, and I’d just shortened the through-tenons. 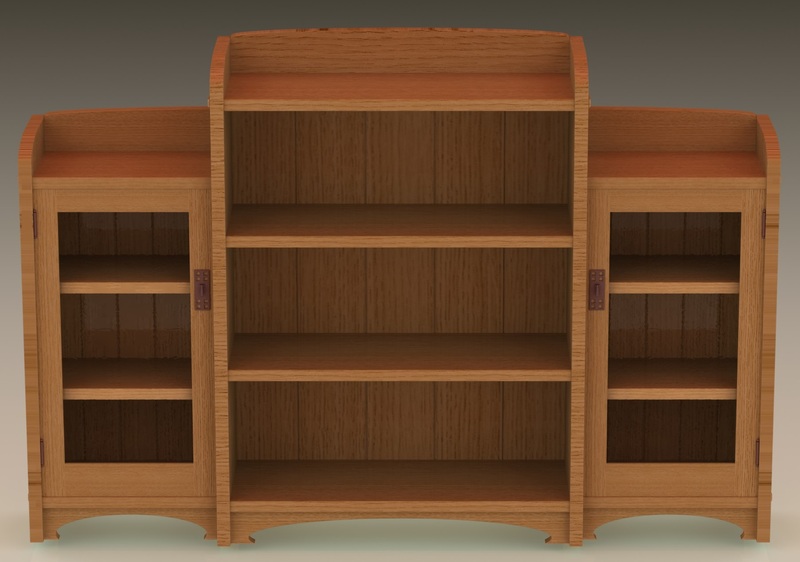 Originally the tenons we about two inches narrower than the bookcase was wide, so they nearly cut the case sides in half. That would have been an unfortunate moment in the shop when I realized that, right? 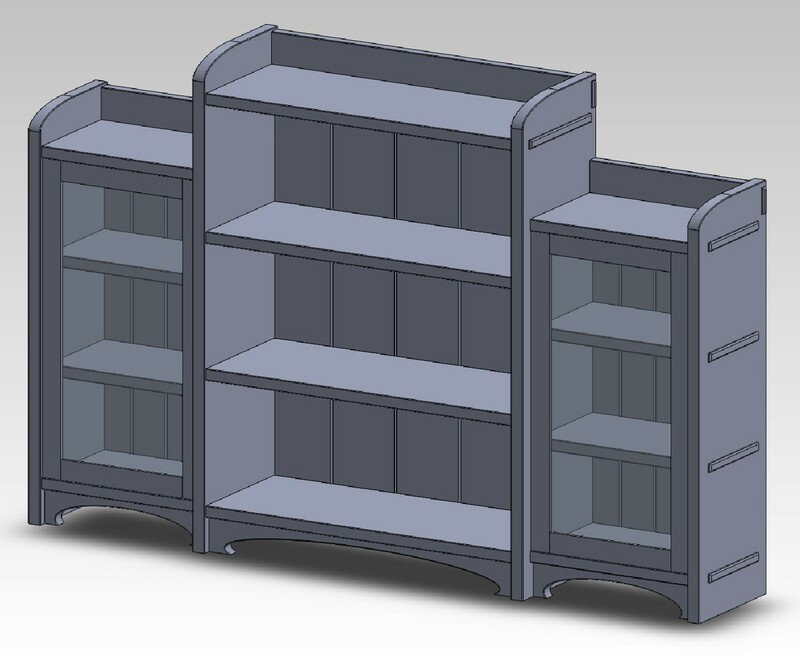 My concern is that there isn’t enough structure to keep the side pods from pulling out of the center unit, the only thing keeping it there are the 3/8″ long stub tenons on the ends of the shelves, back splash and toe kick. The solution, I think, is to put some mechanical strength into that joint. 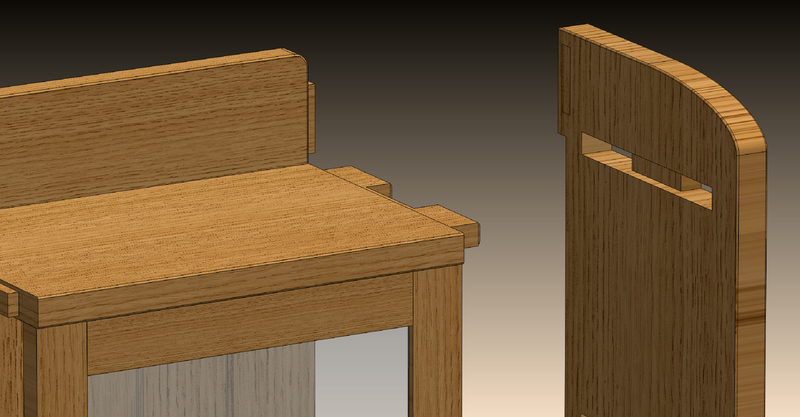 The best way I can think of is to substitute a sliding dovetail joint for the stub tenons. The decision to add this joint gives me loads more confidence in the structure of the design, but it also sets off a small panic attack because it’s not at all forgiving in terms of fit. If it’s too tight it won’t go together — or worse will seize up during assembly. If it’s too loose it won’t have the strength it needs. There can be a lot more slop in a hidden tenon. So the first thing I did was go look at how people make this joint. It could be done with hand tools, but I doubt I’ll do it that way. So the more common approach is to use a dovetail bit in a router to cut the slot and shape the flared tenon. I looked at bit sizes and found a Whiteside bit that will make a large enough cavity without having to re-set the alignment to cut the groove wider. When I do this, I’ll remove the bulk of the waste with a straight 5/8″ bit in several passes. Then I’ll use the dovetail bit just to cut the walls and a shaving off of the floor of the groove. 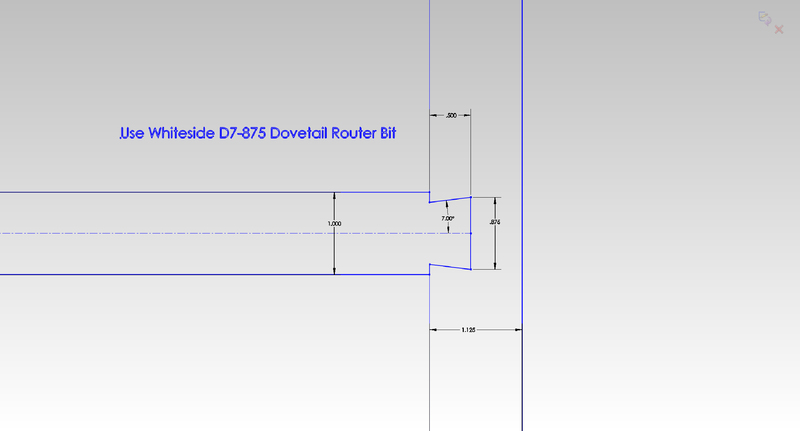 I drew up a diagram of the joint in 2D to check out the router bit geometry and make sure it will work as I hope. Once I’d figured out the process (at least the theory of the process) and finished talking myself into this change I updated the CAD model. 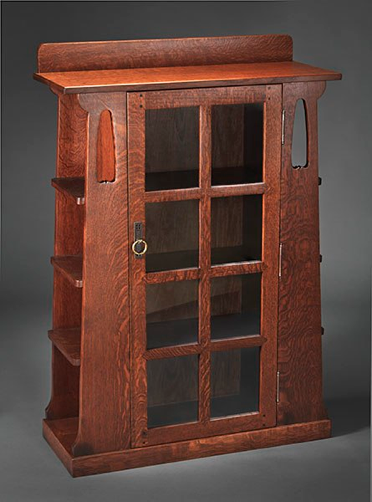 I removed the stub tenons on the two middle shelves in the sides and in the center unit, and added the dovetail. 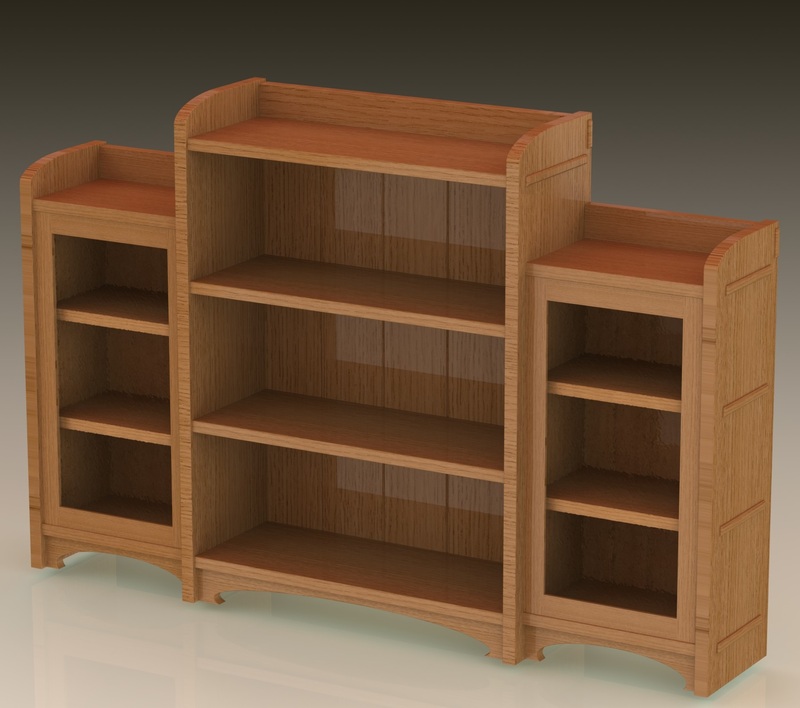 I added the dovetail slot in the case sides and fixed up the model as necessary. 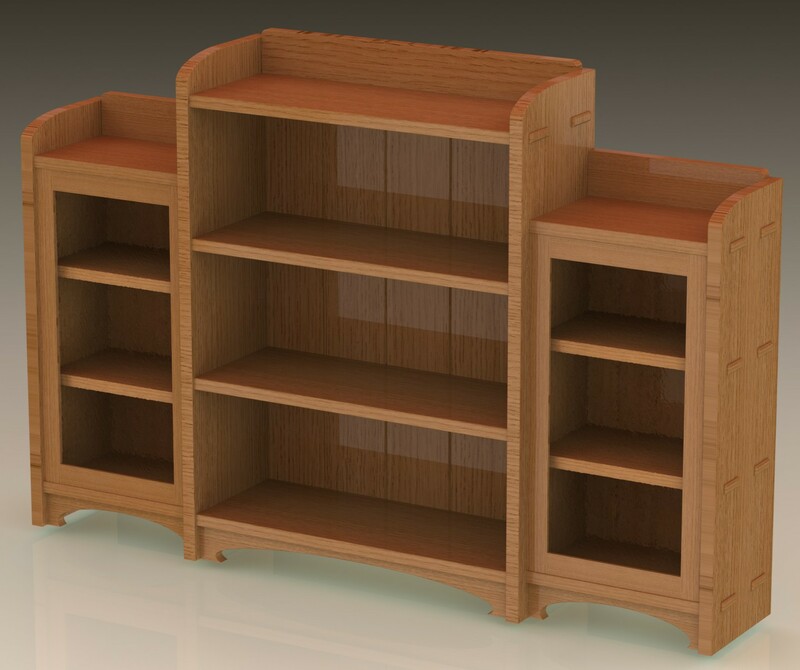 The top and bottom shelves on the side pods still have through twin tenons on one end and stub tenons on the other end. 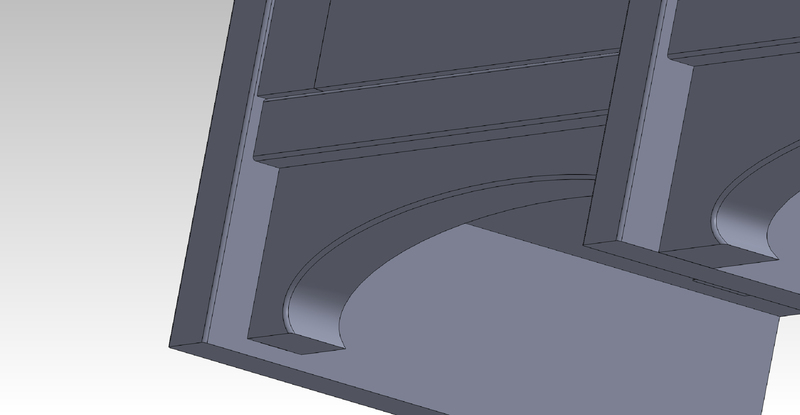 I could change those to sliding dovetails too, but I don’t think it’s necessary structurally, and the setup would be slightly different because of the stopped rabbet for the back. I might still change those, I’ve been know to reverse myself on occasion. This is the view of the back of the unit, with the ship-lapped back removed. 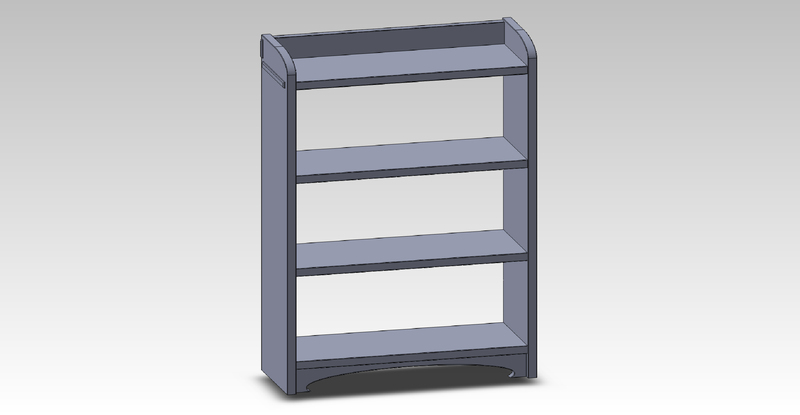 Back of modified case showing sliding dovetails for the middle shelves. There are a couple of other “tweaks” to the design too. The top profile on the back splashes now has an elliptical arc, I think this is a nice improvement. Ralph (Accidental Woodworker) nudged me in this direction. It was something I wanted to try, and I’m glad for the shove. It sorta wakes things up. The doors are different now too. I made the stiles and top rail wider by a quarter of an inch, and the bottom rail wider by a full inch. I think the wider bottom rail is an improvement. 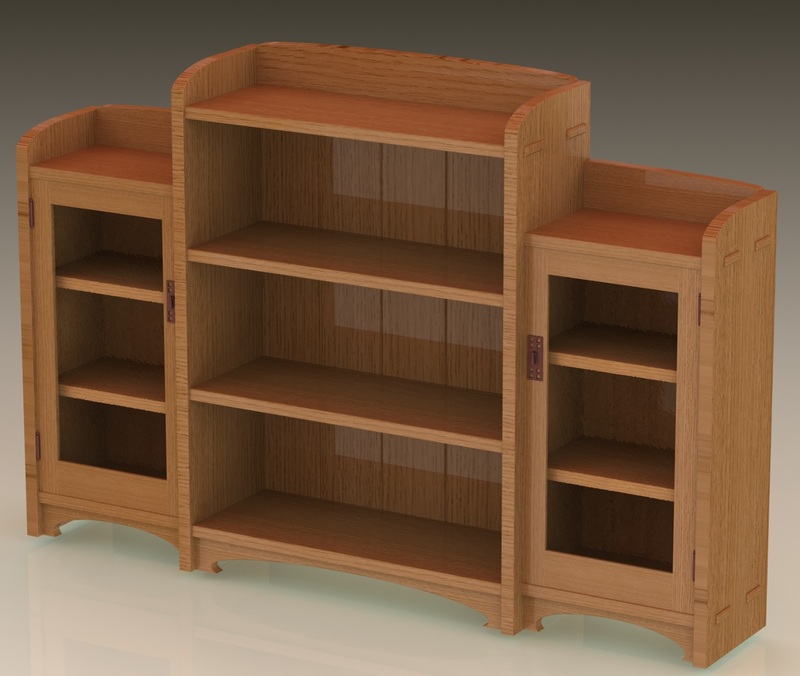 I added hinges and pulls – although I just made these pulls up, I don’t think you can buy them. I’ll almost certainly having something similar but different (and commercially available). The arc in the top of the back splashes looks more subtle than it is in this view. In a straight-on view is more apparent I think. 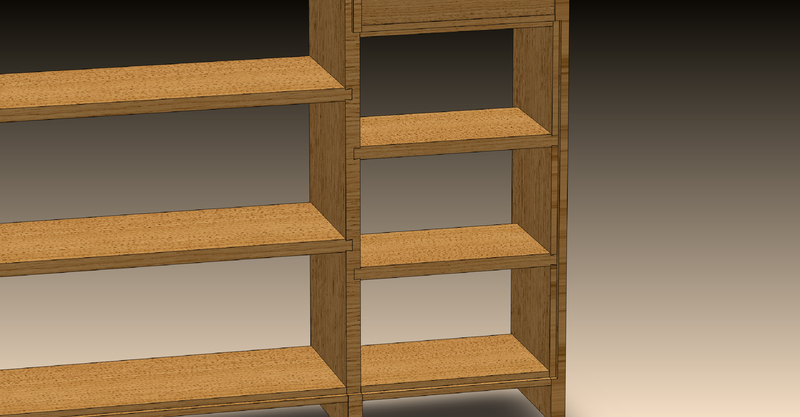 Aesthetically, I don’t think I’m missing anything by omitting the through-tenons on the middle shelves. I’m feeling pretty good about the overall visual impact and about the structural integrity of the unit. I don’t think I have any problematic wood movement issues, and except for the sliding dovetails there isn’t anything too concerning in the construction. The through tenons worry me a bit I guess, that might be fussy. What’s left in the design? A few details, mostly. 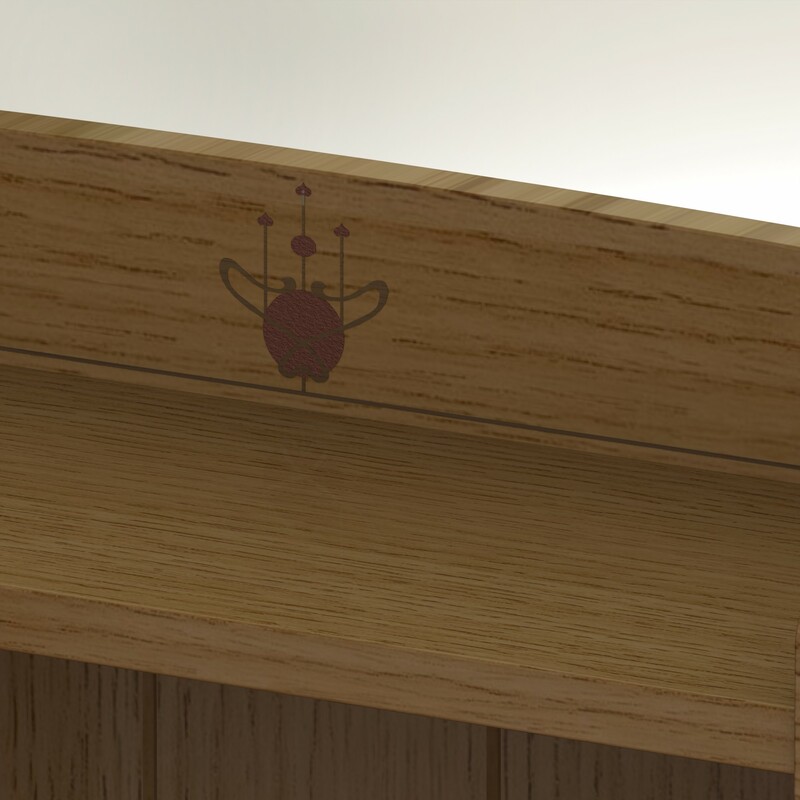 I want to add pins through the edge of the case sides to lock in the through tenons. I want to try adding ebony pegs to the doors at the joints. I want to play with adding an inlaid design in copper and pewter to the back splashes. And I need to design the stained glass panels for the doors. 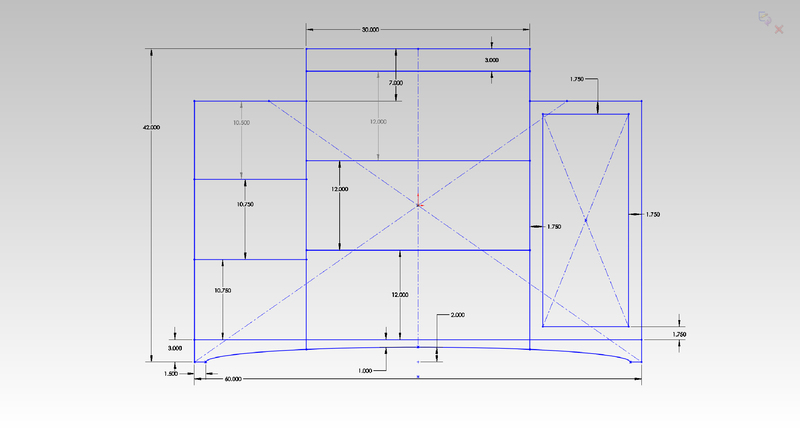 Finally, I need to develop a set of plans that I can take out to the shop too – but that fairly simple since I have the whole think in 3D CAD, it’s just plunking parts on pages and organizing the dimension callouts.